Sucker for A(ny) Man in Uniform? Tammy normally is watching TV when I get into bed at night, but thanks to the “Greatest Christmas Present Ever” (cordless headphones) I can’t hear what she’s watching. That wasn’t the case when I got in bed last night. I wasn’t sure about what I was hearing and since Tammy didn’t have her headphones on I decided to ask her opinion. Me: Do EMTs really count as uniforms? Tammy: Do they wear uniforms? Me: But so do Wal-Mart workers. Tammy: No they don’t. They wear a vest. Me: What about McDonald’s workers? They wear uniforms. Tammy: Oh my God, shut up! She grabbed her headphones and turned away from me. Gallery | This entry was posted in Daily Life and tagged daily life, hot ment, humor, Tammy, uniforms. Bookmark the permalink. 11 Responses to Sucker for A(ny) Man in Uniform? 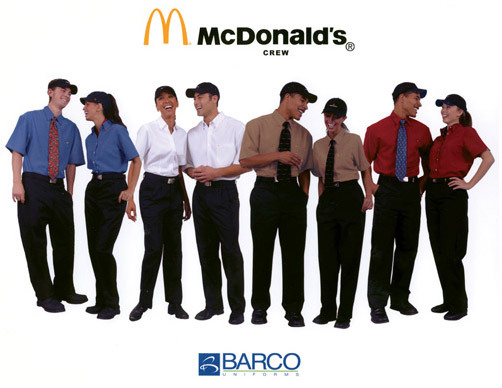 So I take it you’re digging on those McDonald’s uniforms huh? HAHAHA!!! Jason, the key is life-saving uniforms. Mcdonalds..no, a supreme court judge..no…a marine…HELL YA. Ahhh… Now that makes sense. The original statement is too general but I guess “I love men in life-saving uniforms” would be too wordy and prolly would offend all of the McDonald’s workers and Supreme Court Justices. Yes. As has been said there has to be some sort of “hero” aspect to the uniform. Like… because I earned the right to wear this I can rescue you. And look damn good doing it. lol. Yep. Uh, heroic uniforms – or half-uniforms. That’s the ticket. Definitely. I knew there was a reason I follow your blog. Very nice picture, er um, I mean post. Only if the pimpled teens at my McDonalds suddenly age a few years, get ripped, get hot…and don’t get my order wrong. Still waiting to actually catch a glimpse of firemen standing around the fire hall like that, but a girl can dream.